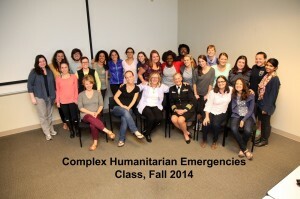 Professors from the Nell Hodgson Woodruff School of Nursing recently led a three-day course on Complex Humanitarian Emergencies (CHEs), specifically for nursing students. This new course introduced students to the field of global response to CHEs, which encompasses health crises, like the Ebola outbreak in West Africa. Students interacted with a variety of actors and agencies involved in CHEs. Guest speakers were from a variety of organizations including Emory University, the Centers for Disease Control and Prevention, Doctors without Borders/Medecins Sans Frontieres, the Carter Center, and CARE. Participants examined global standards that guide humanitarian practice such as the SPHERE guidelines and the Minimum Initial Service Package (MISP) for reproductive health in crisis situations. One of the biggest nursing leadership challenges of CHEs is determining the priority of the different levels of the emergencies and having a quick response to the needs of the population. The students were presented with case studies to help them rationalize the decisions made regarding the limited amount of supplies that could be transported due to the limits on airlift capacity. 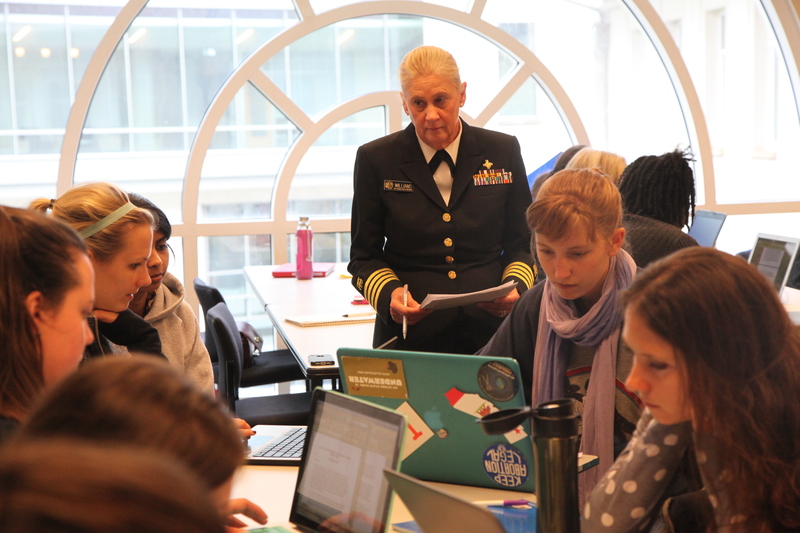 “It stretched and challenged us to be methodical, yet creative in our thinking about a complex problem,” said Laura Hilb, School of Nursing MSN student. “I gained skills that will help me work in CHE’s and in non-emergent settings, because skills in cultural and political awareness, assessment, and coordination are useful everywhere.” Students believe this course motivated them to, in the future, be part of a team that helps meet important needs in CHE’s. 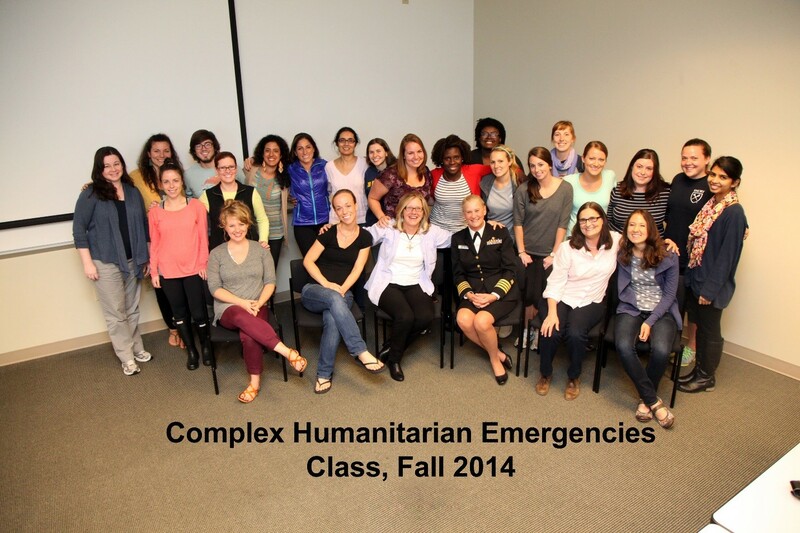 The CHE course was designed for students who are interested in working overseas in emergency and/or post-emergency settings, and who are committed to building practical field epidemiological methods skills for resource poor communities. Students interested in the course should contact their faculty adviser for more information about registering. For more information about the CHE program, please Elizabeth Downes at edownes@emory.edu. 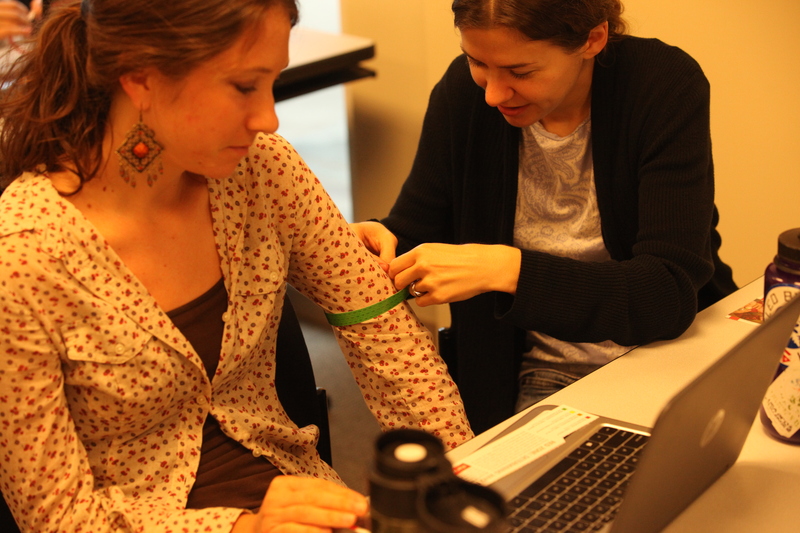 Measuring for the length of an arm band. 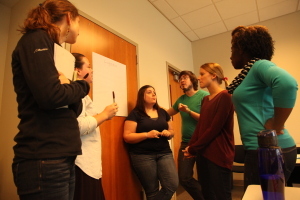 Students work together to develop crisis-management plans.